A television is a magic box that can be so mesmerizing. And thus, it deserves a stylish TV stand. Unfortunately, a stylish TV stand can be pricey. Well, if you want to have a nest egg, doing a DIY project can be your safe bet. Read on to find 11 mind-blowing DIY TV stand ideas that fit any room in your home. This TV stand looks exceptionally cool with small wheels supporting it. The wheels allow it to be moved wherever you want without breaking a sweat. Besides, the colour of the wheels adds a bit nuance to the TV stand. The TV stand also features two wide shelves that can be used to store a DVD player, books, or CDs. Therefore, you can grab any book you want to read in a jiffy. It is definitely a great idea as you will not have to invest in another bulky shelf that takes up a lot of space. To add more personal accent, you can put some wicker baskets on the shelves. The baskets do not only accentuate the TV stand, but also helps you organize some odds and ends. Looking for a DIY TV stand idea on a budget? Try this one. This TV stand is made out of well-worn wooden crates that are stacked up to form some shelves. Therefore, it is obviously affordable and effortless. You only need to find six old wooden crates in your storage room or a flea market near you. After that, stack them up to form two rows – three at the bottom and three at the top. You can just leave them that way or screw them so they can be sturdier. The cubical wooden crates can make pretty good shelves. You can store CDs and board games there. If you are not into the distressed look, you can stain and seal them using polyurethane for a clean and sleek look. As the centre of entertainment, your TV stand has to hold all the things that you need to have fun. Therefore, it would be great if the stand consisted of some compartments that you can use to store various kinds of thing including your knick-knacks. This white TV stand features some usable compartments. It also features sliding barn doors that denote a modern farmhouse style – classic, yet stylish. Above the TV stand are some wall-mounted racks which add more storage space for you. You can put some pictures or printed quotations on the racks to create a nice centrepiece. Have an undersized room? No problem! You can still have a stunning TV stand in your small room by repurposing a wooden easel. This TV stand is such a must-have item for an avid painter. The stand looks like a wooden easel holding a flat LED TV rather than a canvas – simple, unique, and brilliant. The triangular design allows it to fill in an awkward space like the corner of a room so you can optimize it well. It features three tiny wheels which makes the stand quite movable. It also has a rack beneath the TV that you can use to put a DVD player or video game. The design enables it to be placed in any spot, even the most awkward space. You might not get your best viewing angle as the TV lean to the stand significantly. Many people are dying to have the look of a mid-century modern style. If you are one of them then, you are going to love this modern TV console. The table has four spacious shelves that enable you to stash CDs or magazines. You can also put a DVD player in the shelf so you can sit back and enjoy your favourite movie instantly. The sleek design provides the touch of modern look while the brown wooden shelves and legs represent a rustic look. They really make a pretty good team that perks your living room up as well as holding the TV in place. Who says classic TV stand is old-fashioned? It’s not old-fashioned. It’s amazing! This brown TV stand is quite large to hold a TV set, DVD player, and some other stuff that you want to grab in no time. The elegant design embellishes the TV perfectly – making a conspicuous focal point. It features sufficient storage space like drawers and shelves that help you to hold the clutter at bay. The sophisticated details will make your living room look more exquisite and luxurious. The details make the TV stand look luxurious. The storage space enables you to keep the living room tidy. The TV stand is quite large which will take up a lot of space. And thus, it is not suitable for a room with limited space. 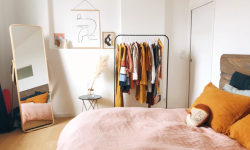 A small bedroom is not a dead-end. You can optimize it by using up all the available space, even the corner. And this TV stand is all you need. It is cheap, easy to make, and fits the corner of your bedroom perfectly. Making this corner TV stand is a snap. You only need two boards, and cut them out to fit the corner of your room. Those boards will be used as usable racks. You can put a DVD player on the top rack so you can watch your favourite movie anytime. Investing in a set of surround sound speaker systems and putting them on the bottom rack is a great idea as you can enjoy the movie with a better sound. Now sit back, grab your popcorn, and enjoy the show. Steampunk style will always bring the charm of industrial look to your living room. If you are a fan of this style, you can try to make this DIY pipe TV stand. It is cost-effective, yet does not lack of charm. You can begin with getting four large boards. Pine would be nice as it is sturdy enough to hold the TV. It will not easily bow due to the weight of your TV and the other stuff. You can sand the boards a little bit to allow the wood stain to adhere easily. When the stain is dry, you can drill in holes. The pipes will go through the holes to connect the boards so make sure the holes have the same width as the pipes. Once all the boards and legs are connected well, you can add four small bottoms to the legs, and you are done. If you are a total novice in DIY, don’t fret! This DIY TV stand is super easy. You don’t have to master advanced DIY skills to make it. Besides, it will also help you to save more time and bucks. All you need to do is just finding four wooden crates and stack them up. You might want to sand them beforehand to get rid of splinters. You don’t want to have a splinter in your finger, do you? Not only do the wooden crates make a pretty good TV stand, but they also make multifunctional shelves where you can store some books and accessories. This rustic TV stand complements the exposed brick chimney nicely, enhancing the rustic look of the living room. Although it does not feature sophisticated design, it is still functional, and you can still rely on it. The secret of this fabulous TV stand is the use of reclaimed wood. Reclaimed woods are well-known for their rustic charm and durability. They might be a bit costly, but you will get a sturdy and durable TV stand that is not prone to damage. But you can still salt away some money if you upcycle the woods that you used for the beamed ceiling. Reclaimed woods always provide the charm of rustic look. Reclaimed wood TV stand can cost an arm and a leg. Do you miss the ambience of the farmhouse? 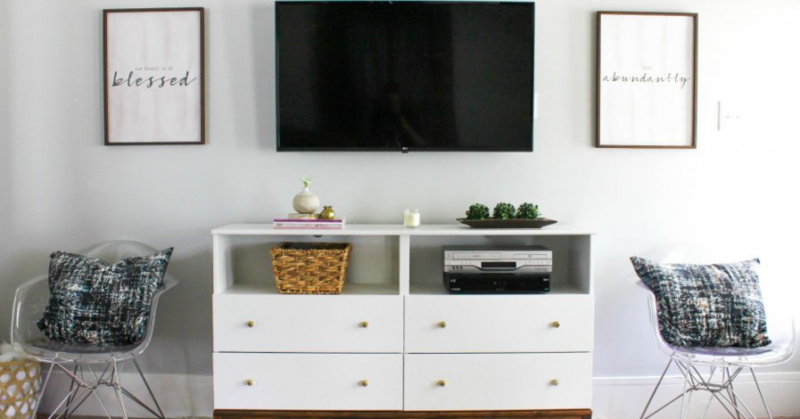 You can bring it right in your living room by making a DIY TV stand that denotes a modern farmhouse style, just like this white TV stand. Once you see it, you will feel like as if you were in a farmhouse as the rustic look conjures up the memory when you visited a farm. The sliding cabinet doors play a crucial role in creating the nuance as they look like barn doors. Instead of painting and coating it with polyurethane to get a sleek look, you can whitewash it to take the rustic look to the next level. You can also stain the top board and shelves for a natural look. That’s all the 11 mind-blowing DIY TV stand ideas that suit any interior and space. You might be amazed by the stunning look of a DIY TV stand. They look like the ones that you can find in stores, except the affordable price. Now roll up your sleeves and accentuate your TV with one of these ideas.